The Day Started with Kaffe Fasset's Persian Poppies class by James Herbison. James has his own Yarn Shop and has a specialty on Sock Yarn you can find it http://www.joyofyarn.co.nz I had such a great time and even though this swatch is a mixture of acrylic and wool, it gave me the opportunity to learn this technique of color. What I actually liked about learning from James is that his world at home is a bit different than mine, his winter is while are summer is. They definitely have a different way of looking at the world as we know. Here we were trying different techniques and candies from New Zealand, all deliciousness aside it was fun to finally meet James and share some time with this wonderful guy! The Same day we went to the Moonshadow Alpaca Ranch owned by two Ladies. What a great experienc to meet the Alpaca you bought the yarn from and to see how well they are treated. I know we all want to get cheap yarn, but nothing like seeing how these animals are taken care of by two caring people. Each yarn has the name of the alpaca it came from, what a fun place to visit. The Alpacas are very shi at first, but very curious about us and what we were doing there, even though they scare easily by sudden movements, they are very friendly and daring. One of them was sniffing my wool bag, guess they liked the wool or perhaps they thought their hair wool end up in such a beautiful bag some day. I smell Cousin Sheeps on this one they said! There was a black Alpaca that had the best eyelashes I have seen , lol! He was gorgeous lol! Later that day we Had Toot's Leblanc come for a visit. Owner's Carl Brittain & Michele Camacho gave us a wonderful presentation. I am honored to have the possibility of having them carry one of my patterns. I am working on getting it tested and when ready I will forward it to them. Michele was chatting with me in Spanish which was a lot of fun, she speaks very fluent Spanish. Her brother was a very Handsome shy guy. 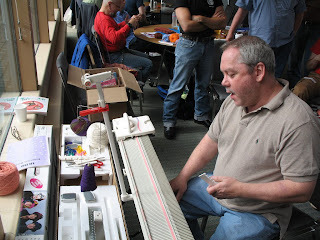 That day we got a Knitting machine demostration by Morgan Hicks from All Points Yarn , and later that night we had a horrible Swedish Vampire movie for Movie Night PJ Party. lol! IKEA will never be the same after you watch this movie. Terrible choice, but it was fun to look at something through the eyes of the Swedish, I know I am so antropological sometimes. Thanks for stopping by!